Be a part of beauty that gives back. In the U.S., from April 26 to Aug. 15, 2018, Mary Kay Inc. will donate $1 from each sale of Mary Kay® Gel Semi-Matte Lipstick in Powerful Pink. Your purchase benefits The Mary Kay FoundationSM, including its support of women’s shelters and survivors of abuse. Mary Kay is committed to bringing an end to domestic violence. Now you can be a part of beauty that gives back. As part of Mary Kay’s Pink Changing Lives® effort, Mary Kay Inc. will donate $1 from each sale of Mary Kay® Gel Semi-Matte Lipstick in Powerful Pink. Your purchase benefits The Mary Kay FoundationSM, including its support of women’s shelters and survivors of abuse. Mary Kay is committed to bringing an end to domestic violence. Just think, you can power through your day with this full-coverage lipstick and feel good that it is making a difference. It features gel microsphere technology for rich, stay-true color that lasts for hours – without leaving lips looking or feeling dry. 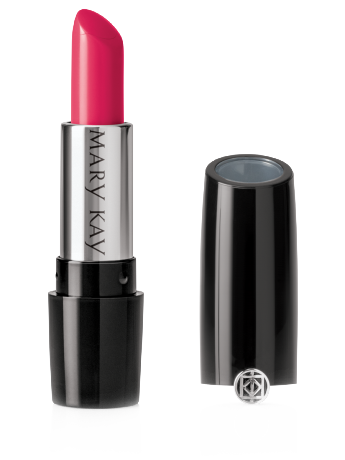 With color this pure, you can saturate lips, delivering a gorgeous level of color clarity. And with beautiful shades to choose from, it’s a breeze to update your look to match your mood or fit your style. The lightweight gel formula glides on smoothly and cushions lips, leaving them feeling soft and supple. Plus, it’s formulated to provide a soft-focus effect with optical enhancers included to scatter light and blur the appearance of minor imperfections. And that’s not all. The clear-top window makes finding your favorite semi-matte shade a snap, whether it’s in a cluttered handbag or makeup drawer. To apply gel semi-matte lipstick using a lip brush, dab the brush on the lipstick bullet, then sweep the brush along lips, starting at the center and moving toward the corners. Repeat to get the desired coverage.